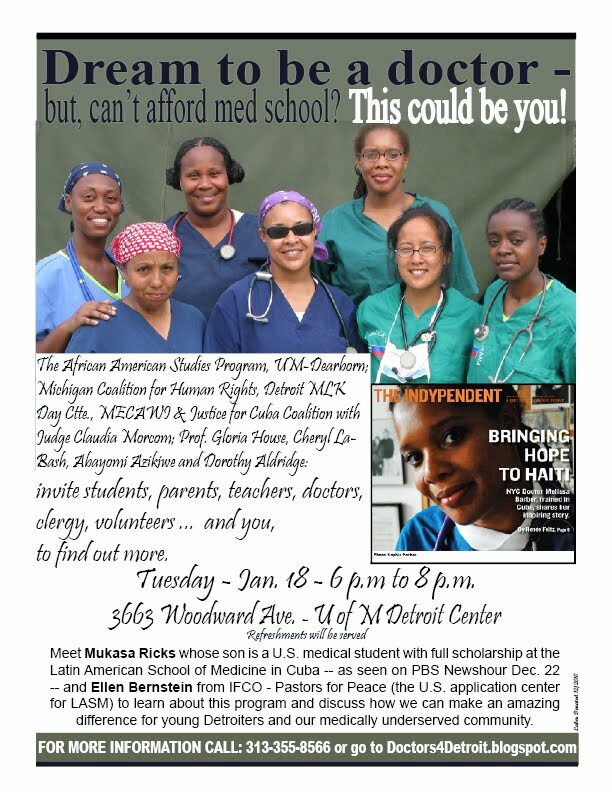 Doctors4Detroit: DREAM to be a doctor, can't afford med school? THESE YOUNG DOCTORS COULD BE YOU! DREAM to be a doctor, can't afford med school? THESE YOUNG DOCTORS COULD BE YOU! Come out to Detroit's Martin Luther King Day march and rally Monday, January 17 at Central United Methodist Church featuring Mukasa Ricks, civil rights veteran and former organizer of the Student Non Violent Co-ordinating Committee, SNCC. Ricks' son is studying to be a doctor at the Latin America School of Medicine in Cuba on one of the full-ride scholarships -- including tuition, room and board, books, everything including a small stipend -- offered by Cuba to U.S. youth from medically underserved communities. See the Dec. 22 PBS Newshour report on this school on youtube. Find out more at a meeting on Tuesday, January 18, 6 - 8 pm, at the Univ. of Michigan Detroit Center at Martin Luther King Blvd and Woodward. Meet Mukasa Ricks and Ellen Bernstein, co-interim director with the Rev. Thomas Smith of Interreligious Foundation for Community Organization/Pastors for Peace in the wake of the sudden death of founder and leader the Rev. Lucius Walker who was well-known and respected in Detroit and throughout the world. Your help is needed to spread the word about this wonderful opportunity and make the connections in our community to support them.